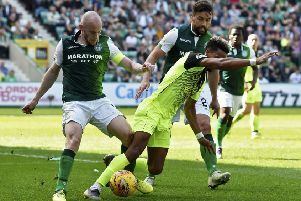 ALAN STUBBS has urged Hibs fans not to expect too much too soon from John McGinn after his latest signing made a surprise debut on the opening day of the season. While the 20-year-old had expressed a hope he might be involved against Dumbarton, he also admitted he felt “one or two weeks away” from playing. But, having revealed he was surprised at the shape the Scotland Under-21 midfielder was in as he trained with his new team-mates, Stubbs named him among the substitutes at The Rock. And he was clearly delighted with the performance McGinn – signed on a four-year deal for a six-figure “development” fee after telling St Mirren he wouldn’t be extending his contract – produced after replacing teenager Scott Martin for the final 33 minutes. McGinn hadn’t played since mid-April after being “speared” by a training ground pole thrown by Buddies skipper Steven Thompson, and Stubbs believes it could be a few months before the Easter Road support see the best of him given that, while he’d been in full training for a number of weeks, he’d only had a “mini pre-season” over the preceding few days. Hibs’ allocation of approximately 1000 tickets for the Championship clash with Rangers at Ibrox on Sunday, August 23, went on sale today based on the club’s loyalty points system and restricted to one per supporter. Meanwhile, the Capital club’s development squad get their season underway as they travel to face Falkirk tonight, kick-off 7pm.